Patrons will be seated on a first come, first served basis. 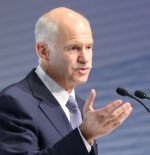 As Prime Minister of Greece from October 2009 to November 2011, George Papandreou has been at the forefront of the global financial crisis. Named as one of Foreign Policy magazine’s “Top 100 Global Thinkers” in 2010 for “making the best of Greece’s worst year,” he speaks with authority on the state of the Eurozone today and the future of the European Union. In these tumultuous times, few are better placed than Prime Minister Papandreou to provide insights into the Euro Crisis and the mounting challenges in democratic governance. Papandreou also held the portfolio of Foreign Minister, a position he had held from 1999 to 2004, expanding his legacy as a leader in diplomatic bridge-building and reiterating his commitments to stronger international relations. His administration spearheaded ‘Agenda 2014,’ an initiative which seeks to integrate the Western Balkan states into Europe by 2014. As Foreign Minister, he was also instrumental in the successful negotiation of rapprochement with formerrival Turkey. Papandreou was also a key player in the negotiations that led to Turkey’s candidacy for membership in the European Union in 1999 and Cyprus’s entry into the EU in 2004. Around the world, Papandreou has deployed ‘Green Diplomacy,’ calling for the protection of the environment. He has championed human rights at home and abroad, and has actively sought to maximize citizen participation in governance through information technologies.He has also held other government posts, including Under‐Secretary for Cultural Affairs and Minister for Education. Born on June 26, 1952 in Minnesota, Papandreou spent his childhood in the U.S. and Canada, until his family returned to Greece in 1961. After completing his university studies at Amherst College in Massachusetts and graduate studies at the London School of Economics, Papandreou won an MP seat for the Pan‐Hellenic Socialist Movement (PASOK) in 1981. He was elected leader of the party in 2004, a position he kept until March 2012. Papandreou is also president of the Socialist International, an international association of political parties, of which PASOK is a member. In 2012, Papandreou was named a Visiting Fellow at Harvard University’s Institute of Politics. In 2013, he served as a Global Fellow and Adjunct Professor at Columbia University’s School of International and Public Affairs as well as a faculty member in the Master of Public Affairs program at Sciences Po in Paris.